Took a third try to get into this one, maybe cos I had a very busy day. 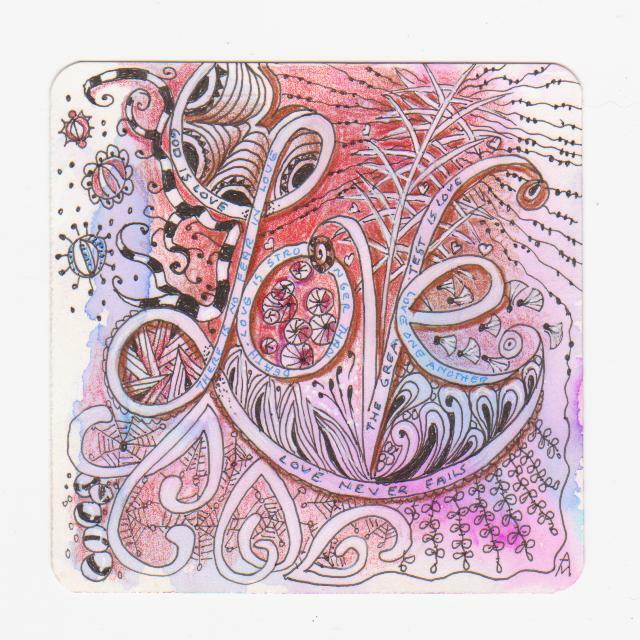 In the end I decided you have to have colour for love, so used one of my colour wash tiles. I enjoyed putting in highlights and playing with the tonal qualities. Love the color wash and the colors themselves and finally the light and lacey feeling of this tile. Nicely done! This is a beautiful tile in every way! Just excellent!!! Nice play of colour, tangle and typo!! And it is beautiful just like love! Your tile is bursting with pizzazz and fun! I love the colors. Makes me want to try a color wash! Wow - this looks like a celebration! A party! A love-fest! :) Very nice! This is an absolutely beautiful piece. This is so lovely! Just to show you how inspiring it has been to me to see these pieces, I have put some of my tangle journal up on beaminator.blogspot.com . Thanks for the encouragement.